We offer Certified Laughter Yoga Training and Personal Development Courses for individuals and organisations. We can run our Laughter Yoga training at your office, workplace or venue. Contact us to discuss your requirements. Minimum 4 participants required for private group bookings. We are happy to travel. And Why Train with Us ? We joined the Laughter Yoga World because we care about people and making a difference. We saw laughter as an amazing tool to make a difference to the lives of those we work with. We really care about You and your laughter journey. We are really big on support with further opportunities to access CPD training days, events and more. We also offer a private support group on facebook . We will connect you to your new Laughter Family. Odette has a background in various Holistic Therapies including Laughter Yoga and Energy Healing, Sound Healing and Meditation. Known for her caring nature which includes random acts of kindness and offering a warm heart, a pair of socks and a woolly hat and conversation to homeless people. 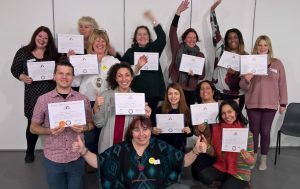 She works full time running her wellbeing and laughter yoga training company, Laughter Yoga Wellness London and UK, London Gong and The Laughter Yoga Wellness Training Academy all based in London covering the UK. She has worked with Charities, Community Groups, Banks, City Festivals, NHS, Media Companies and more. From private parties to Small, Medium and Multi National Corporations. Laughter Yoga has been life changing for her and now she wishes to spread the joy by training others to connect with more joy and laughter yoga. Our new leaders are doing fantastically. We have trained people from all walks of life including many professionals including school teachers, physiotherapists, psychotherapists, counsellors, business owners, actors and actresses, holistic and wellbeing professionals, healers, therapists ……. etc: We were delighted to hear that two of our leaders have started to introduce laughter yoga within a chronic pain management programme which is fabulous. So far this is going really well which is great news. They also refer their patients to our laughter club. Our main training Location is centrally located for Angel and Islington, Kings Cross and Farringdon in the very trendy Clerkenwell area of the City with a choice of excellent travel links, both Rail, Tube and Busses. You will be spoilt for choice at lunchtime. Our training academy is located in the City of London. Entrance at 37d Amwell St, Clerkenwell, London EC1R 1UL. The city of London is easily accessible for all major airports including, Heathrow, Gatwick, Luton, Stanstead and City of London. Do ask for our booking form which contains our full terms and conditions before you make any travel or accommodation arrangements. We are within walking distance of many hotels and hostels with choices to fit every budget. Many within walking distance. London is a vibrant city with so much to do, why not combine your training with a visit to the sites. Please do check availability with us before booking accommodation and flights or travel. Our classes are small so they do fill up early! We can also come to you, if you have a group of people who wish to train as laughter yogis, we love to travel.